This latest mural is the THIRD to take life on Castlegreen Drive! After adding on a sort of garage extension / man cave / pool room, Roger felt that what the room needed was some fairy influence. He pictured a scene rolling from dusk to night to dawn to day, simultaneously moving through the seasons. I suggested a great circular parade circumnavigating the room, and thus began the great Fairy Parade. Each main wall represents one of the four seasons. They show a warm summer night, a bright fall morning, a crisp winter day, and a breezy spring afternoon. 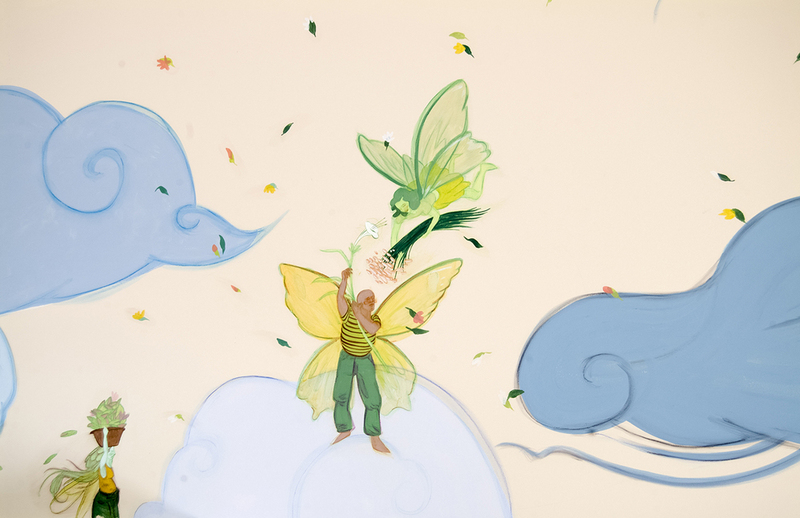 This mural was a great opportunity to play around with character design; click here to see detail shots of each fairy on the main project page!